the Delhi government has increased the budget for supplementary nutrition under the Integrated Child Development Services (icds) from Rs 2 to Rs 4 per child per day. The amount was increased to tackle rising food prices as well as to introduce variety in the menu to improve the nutritional intake of beneficiaries, says Debashri Mukherjee, secretary of the Department of Social Welfare, Delhi. 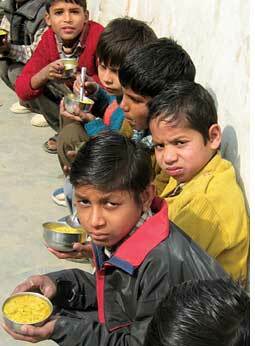 ngos providing hot cooked meal under the programme, however, feel the increased budget is insufficient. The government has increased the food quota for every child from 200 gm to 300 gm. The quantity of weaning food, for children below six months, has also been increased from 60 gm to 120 gm. Under the changed menu, children will be given laddoo (sweet) once in a month and suji ka halwa thrice a month. The state government has even specified the number of cloves and resins that needs to be added. "All this requires more money and extra labour," says Sunita Bhasin, director of Swami Sivananda Memorial Institute, an ngo that provides hot cooked meal to about 14,000 beneficiaries in Delhi. Though most of the state governments provide food grain for icds schemes, ngos in Delhi procure food grain from the market. "This deprives us of the cushion against high food prices," says Bhasin. Social welfare minister of Delhi Yoganand Shastri assures: "We are planning to hike the budget for icds to tackle the soaring food prices. But nothing has been decided yet."